If you are an aficionado of retro gaming—you might have heard of Sword of Fargoal, a game originally developed by Jeff McCord for the Commodore VIC 20. Fargoal was, in many ways, an innovative game for its time that has gathered a cult following through the years, with versions written for PC, Mac and, more recently, the iPhone. Now, Sword of Fargoal Legends has landed on the iPad in a special edition designed specifically to take advantage of Apple’s tablet; produced by Fargoal LLC, with McCord still leading the development team, the game is published by Chillingo. The graphics might not impress, even on the iPad, but it's the hours of engrossing gameplay that will keep dedicated fans coming back. The premise of Sword of Fargoal Legends is simple enough: you are an adventurer tasked with finding the titular sword. Unfortunately, the latter is located deep in a multi-level dungeon inhabited by various and sundry creatures—from giant rats to terrifying monsters—intent on ensuring that you won’t make it out alive. As you progress through the dungeon, you gather items like potions and spell scrolls, as well as collect gold coins that can be converted into experience points at special locations throughout the game; these, in turn, allow you character’s skill and power to advance. 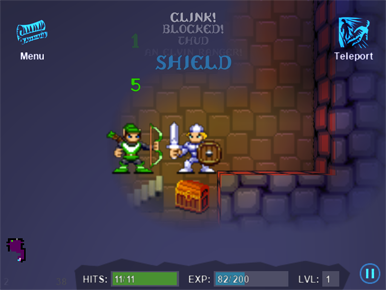 As you descend deeper and deeper in to the levels of the dungeon—which are randomly generated and, therefore, guarantee a slightly different gameplay every time—your character will not be the only one whose powers grow, however: enemies become both faster, which makes evasion less easy, and tougher to beat. This causes the game’s super-simple combat system to become, at times, highly frustrating: your only options when fighting are to watch your character attempt to slay his enemies or withdrawing and trying to escape. Fargoal’s graphics and sound are deceptively spartan: the former, in particular, retains the exquisitely blocky and simplistic aspect that befits a game with such a long heritage, but displays a distinctively modern look through subtle 3-D effects, the use of pinching to zoom in and out, and a very fluid interface. The game only runs in a fixed landscape orientation, which also happens to be the wrong one if you happen to be using Apple’s iPad Case and want to rest your device at angle that doesn’t point away from you. The old-school sound effects, worthy of a Commodore 64 game, are interspersed with a much more modern (and pleasant) orchestral score composed by Daniel Pemberton. The protagonist is controlled through a combination of swipes to indicate a direction of movement and taps to perform a number of actions, such as manipulating an item or casting a spell. The interaction with the various objects in the game is simplified by the use of a “smart button” that allows you to perform whatever action is most appropriate at any given time: open a chest, push open a door, and so on. The choice of swipes for movements—essentially using the surface of the iPad as a virtual gamepad—can be extremely frustrating, particularly at the beginning when one hasn’t quite grown acquainted to the game’s sensitivity. During the first hour or so of playtime, expect to find yourself running around in circles, seemingly unable to position your character exactly over the spot you want to reach. Eventually, as you become accustomed to the interface, this becomes less of a problem—but that’s, of course, assuming that you don’t just get frustrated and give up first. Like its predecessors, Fargoal is not an easy game to play, especially at higher levels. The risk-to-reward ratio of the game is a little too skewed in favor of pain and misery—even as you make your way trough the first three or four levels of the dungeon, you will find a disproportionate number of traps, as well as all sorts of things that tend to blow up in your face when you get a little too close to them. Add in the fact that the levels themselves are randomly generated, rather than carefully designed by hand, and the gameplay can get challenging in a hurry. On the other hand, Fargoal is also fairly generous when it comes to your character’s ability to heal and with the amount of gold coins that can be easily found just about everywhere. As an added bonus, once you find the Sword of Fargoal in the deeper level, you only have 2,000 seconds (that’s around thirty minutes) to find your way out to the surface. Half an hour may seem like a long time, but, based on previous run-throughs of the game—it won’t be. This game is not for the casual player: even though the combat system is simple and intuitive, completing your quest takes dedication and a good amount of patience (not to mention luck). On the other hand, the gaming experience is efficient and pleasant: the app’s launch takes only a handful of seconds and paused games can literally be resumed in an instant from the main menu, without going through multiple taps. The saving system even allows you to create a number of different characters, each hosted in its own unique world, and switch among them as you see fit. Even considering the relatively steep $8 price point, Fargoal is an excellent buy for the right gamer. If you are a fan of rogue-like games and can muster the patience to make it all the way to the mythical Sword, this game can provide you with essentially endless entertainment that never really gets old.